I created the Machine Learning Canvas to make it easier to ask the right questions at the beginning of an ML project, and to save people from wasting all that time and money. It’s now used and recommended by people such as Carlos Escapa, Global AI/ML Practice Lead at AWS (blog), and Bill Schmarzo, CTO of IoT & Analytics at Hitachi (blog). The MLC is a framework that helps design ML systems properly, and serves as a key communication tool for domain experts, data scientists and engineers. I’ve been using it since 2015 when consulting for various clients, and it’s now being taught at UCL School of Management. 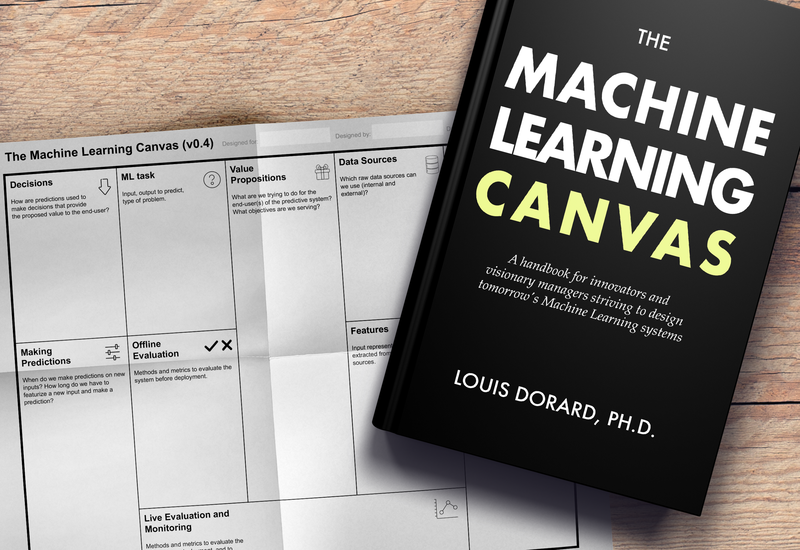 Today I’m releasing the first draft of my new book that’s simply called The Machine Learning Canvas. It contains everything there is to know about this framework, in a 1-hour read that summarizes years of experience and hundreds of hours of research. I started sharing this book with my clients, and I’m now making it available to you for free. I want to make the MLC useful for all, and also to thank you for being part of my audience! Download the book now at https://gum.co/mlcanvas/gbi40xs and spread the word! ML⚡️DL — AI to Hell! Want to make an impact with Machine Learning / Deep Learning? Read this!